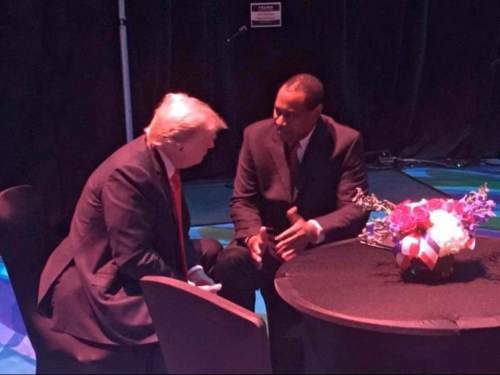 Courtesy | James Evans Utah Republican Party Chairman James Evans chats with Donald Trump backstage before a rally in Las Vegas. Leah Hogsten | The Salt Lake Tribune Republican presidential candidate Donald Trump speaks during a campaign rally at Infinity Event Center, Friday, March 18, 2016 in Salt Lake City, Utah. 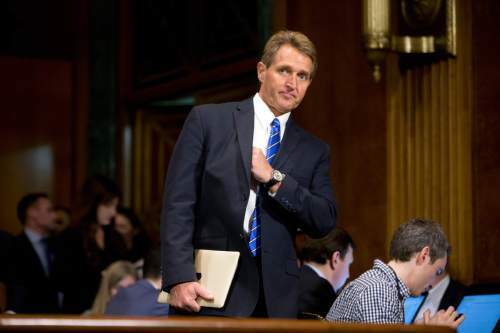 FILE - In this March 9, 2016, file photo, Sen. Jeff Flake, R-Ariz., on Capitol Hill in Washington. Congressional Republicans are beginning to accept, and even embrace, an outcome that was once unthinkable: Donald Trump as the GOP presidential nominee. ìHeís looking more inevitable, yeah. Iíve been wrong all along,î said Flake, an outspoken Trump critic. ìMy feeling about Donald Trump is, I donít think that thatís our best foot forward at all. And I canít imagine being forced to take some of those positions that heís taken. 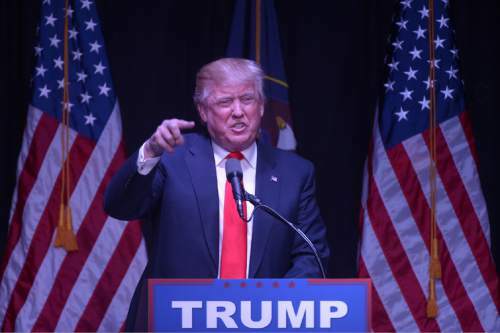 A ban on Muslims, build a wall and make the Mexicans pay for it, you name it.î(AP Photo/Andrew Harnik, File) Leah Hogsten | The Salt Lake Tribune Republican presidential candidate Donald Trump speaks during a campaign rally at Infinity Event Center, Friday, March 18, 2016 in Salt Lake City, Utah. Leah Hogsten | The Salt Lake Tribune Republican presidential candidate Donald Trump speaks during a campaign rally at Infinity Event Center, Friday, March 18, 2016 in Salt Lake City, Utah. Jim Cole | AP file photo Donald Trump has a Mormon problem that is most pronounced in Utah but extends to other Western states that could make a difference in the November election. Leah Hogsten | The Salt Lake Tribune Republican presidential candidate Donald Trump speaks during a campaign rally at Infinity Event Center, Friday, March 18, 2016 in Salt Lake City, Utah. Donald Trump&apos;s Mormon problem extends beyond Utah and, if it persists, he may find himself scrambling in traditional battlegrounds like Nevada and Colorado and struggling in Republican-leaning Arizona. That has turned one of the nation&apos;s most conservative states into an interesting presidential bellwether. "I wouldn&apos;t expect Trump to lose in Utah but the margins matter and Utah polling is worth following for what it might tell us about Mormons in surrounding states," said Kyle Kondik, managing editor of Sabato&apos;s Crystal Ball at the University of Virginia, a widely watched political handicapping site. Kondik shifted Utah from the "safe Republican" to "likely Republican" categories and Arizona from "likely Republican" to "lean Republican" on Thursday largely because of polls showing Trump with less than enthusiastic support from members of The Church of Jesus Christ of Latter-day Saints, which has traditionally been the Republican Party&apos;s most reliable voting bloc. 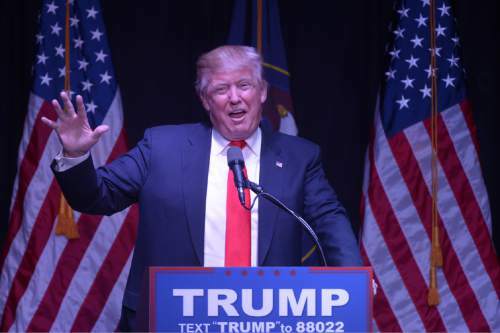 Only 41 percent of Utah Mormons backed Trump in the latest Salt Lake Tribune-Hinckley Institute of Politics poll from early June, with 22 percent supporting Democrat Hillary Clinton, 14 percent backing Gary Johnson, the Libertarian candidate, and 21 percent undecided. The numbers are a clear sign that Mormons haven&apos;t gravitated to the Republican after a contentious primary season in which Trump finished a distant third in Utah caucuses. 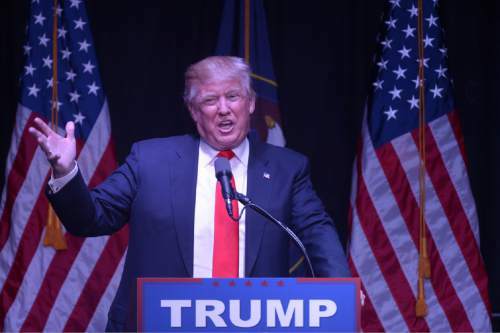 The Tribune-Hinckley poll found that 63 percent of Utah Mormons had an unfavorable view of Trump and 20 percent had a favorable one. Clinton had even more trouble with Utah Mormons, with 79 percent having an unfavorable view, to 13 percent favorable. 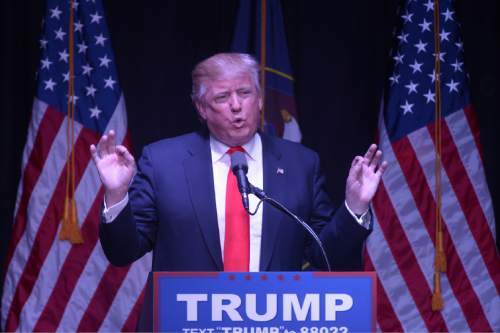 Among all Utah voters, the poll, conducted by SurveyUSA, showed Trump and Clinton tied at 35 percent. Johnson received 13 percent. In interviews, Mormons in Utah have criticized Trump for his bombastic personality, past infidelity and his policy positions, such as calls to temporarily ban Muslims from entering the country. And notably, Mitt Romney, a Mormon and the 2012 GOP presidential nominee, has refused to vote for Trump, a man he doesn&apos;t believe has the temperament to be president. Also last week, Brent Scowcroft, national security adviser to Presidents Gerald Ford and George H.W. Bush, and a Mormon, Utah native and lifelong Republican, went beyond Romney to actually endorse Clinton. For his part, Trump has often mocked Romney as a "choker" and questioned whether he was really Mormon at a rally in Utah. A new poll in Arizona shows that Latter-day Saints there are also slow to rally around Trump, a wealthy and famous real-estate developer. In the state&apos;s conservative 5th Congressional District, which includes suburbs of Phoenix and the Mormon enclave of Mesa, 60 percent of Mormons viewed Trump favorably, while 37 percent held an unfavorable opinion. That&apos;s clearly more pro-Trump than in Utah, but it was roughly 15 percentage points worse than Trump performed with every other religious group in that district, which is represented by retiring Rep. Matt Salmon, who is Mormon. "The numbers don&apos;t lie. 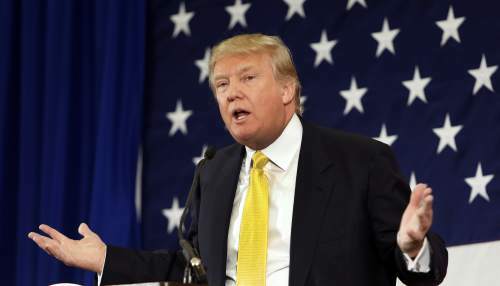 Clearly Donald Trump has an LDS problem," said Michael Noble, pollster with OH Predictive Insights, which reached 462 Republicans in the 5th District, 20 percent of whom were Mormon, on June 20. In an accompanying statewide poll of Arizona, Noble found Clinton with a 4.3 percentage point lead on Trump, a result he called "shocking" in a state no Democrat has claimed since Bill Clinton in 1996. He surveyed the 5th District to see how Trump fared with Mormons, whom he described as power brokers with outsized political influence. The state also is represented by Sen. Jeff Flake, R-Ariz., a Latter-day Saint who has refused to back Trump and would still like the party to find a way to block him from gaining the nomination during the Republican National Convention next month. Flake told Time magazine that Trump&apos;s campaign "weakens the whole party" and hurts Republicans in other contests. "This whole campaign, the Trump campaign, is not good down ballot," he said. "I&apos;m not a Trump fan." Arizona&apos;s population is 6 percent Mormon, according to the American Values Atlas, a survey conducted by the Public Religion Research Institute. Utah came in at 58 percent Mormon and Idaho was 24 percent. Nevada (6 percent Mormon) and Colorado (2 percent) are battleground states leaning toward Clinton at this stage. Nevada Sen. Dean Heller, who is a Mormon Republican, said: "I vehemently oppose our nominee," taking issue with "things that he&apos;s said about women and the Hispanic community across the West." In Utah, Sen. Mike Lee and Rep. Mia Love have declined to say whether they will support Trump, while the other four members of the state&apos;s all-GOP delegation have endorsed the presumptive nominee, albeit without much enthusiasm. Beyond the Mormon factor, Kondik argued these states, along with Utah and Arizona, have two other characteristics that hurt Trump&apos;s chances. The West has traditionally been more open to voting Libertarian than states in the East, giving disaffected Republicans an easy place to land. As an example, Romney has said he&apos;d consider voting for Johnson, a former GOP governor of New Mexico whose presidential campaign is based in Salt Lake City. These states also have growing Latino populations have responded negatively to Trump&apos;s talk of building a border wall and deporting undocumented immigrants. Utah Republican Party Chairman James Evans was concerned enough with Trump&apos;s standing in the state that he met with the candidate in Las Vegas recently, urging him to tone down his rhetoric and securing assurances that Trump will campaign in Utah after the convention.